The new AZENIS FK-453CC is designed to target the growing demand for European-made luxury Crossover vehicles as well as SUVs. 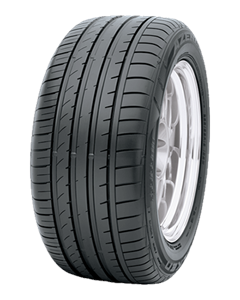 The result is a tyre that offers higher performance, greater longevity and superb style. The FK-453CC boasts a large shoulder block, with a continuous outer rib that provides greater handling and stability. It also effectively reduces tyre noise and improves ride comfort. Additionally, the FK-453CC is solid in adverse conditions, calling upon its three wide, continuous grooves that effectively evacuate water significantly improving resistance to hydroplaning. Finally, Falken has created a stylish new sidewall design which highlights the Falken "F-Arrow" identity, enhancing the overall look of the tyre and complementing the luxury Crossover or SUV.